For my next beadwoven rope project, I chose to use chenille stitch. I haven't really used it a lot, but I knew that it worked up fairly quickly into a rope that held its shape with no need of a core, and yet was soft enough to curve nicely. It turns out that it's just about the perfect stitch for a pretty rope! I'll be doing this again for sure. 1. 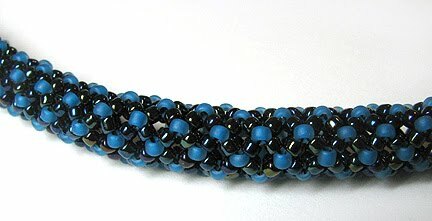 I start with a core of 8 size 11/0 seed beads (color A - shiny black) and make a loop. Tie it, leaving a tail of at least 8 inches. 2. 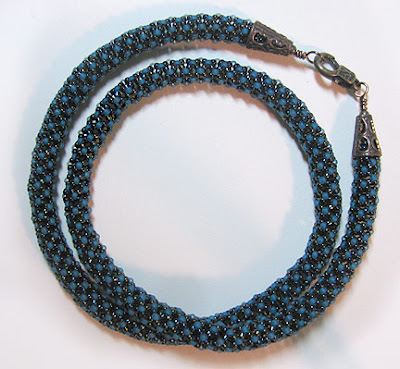 Add 4 size 11/0 seed beads (color B - matte teal), one between each pair of As. Step up through first B added. 3. Add 8 color As, two between each color B. Step up through first A added. 4. Add one B between each pair of As, as in step 2. Continue alternating the two rows. 5. 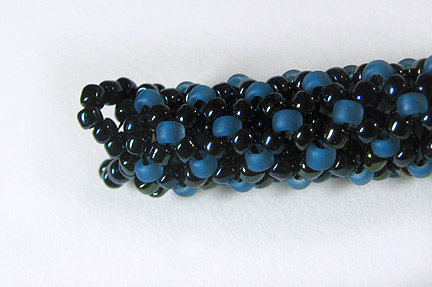 At each end, add two small loops with seed beads (shown below). Look at the instructions for my herringbone stitch rope from last week to see how these loops are used for finishing off the necklace.